‘Ain’t It Funny?’ singer Jennifer Lopez probably wasn’t laughing when she caught a peek at responses to news she’ll be part of a tribute to Motown at this Sunday’s Grammy Awards on CBS (February 10). As we reported here, months ahead of the network’s “Motown 60: A Grammy Celebration,” an all-star special celebrating the iconic label’s 60th anniversary (set to air in April), the ‘Dance Again’ diva will give viewers a foretaste by setting the stage alight with some fancy footwork to some of its greatest hits. 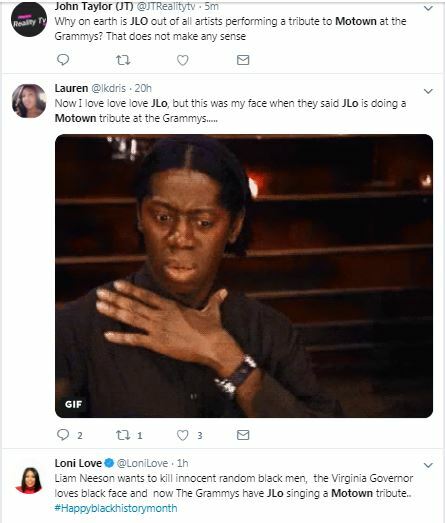 But, while her faithful fan base – affectionately called #JLovers – delighted at the news, some critics weren’t shy about blasting event organizers for choosing the ‘limited’ vocalist for such a prestigious honor. Fans know Lopez has incorporated music from Motown in her shows in the past, namely interpolating the climax of Diana Ross‘ #1 hit, ‘Ain’t No Mountain High Enough,’ in live performances of her own 2014 tune, ‘First Love’ (from the ‘A.K.A.’ album). As of time reported, J.Lo nor The Grammys have not responded to the criticisms. Sit down old menopause ho! If you don’t sound like Christina Aguilera then your old hispanic asss ain’t invited to sing at the black party but you can clean floors and do the dishes though! There U go STALKING ALL MY COMMENTS again. Aren’t you tired of being so ANNOYING. I dont need a STALKER. STAY THE F.UCK UP OFF MY COMMENT BOX. When do u ever see me replying to YOUR COMMENT BOXES? ABSOLUTELY NEVER SO F.UCK OFF SCUM!!!!!!! BTW MY NAME AIN’T NO F.UCKING ‘TROLLMINE’. MY NAME IS Mrs. Martìnez. Now BACK THE F.UCK OFF ME. I KNOW U HUNGRY FOR MY SH|T PIE BUT I AINT MADE U NO SH|T PIE TODAY SO F.UCK OFF MATE! Shut up please. Christina Aguilera sounds better than JLo live even on her worst day. TROLLmine why THE FÜCK did you name your husband (dįildö) Mario Martinez? You should name it something prettier like Cinnamonquandriantavianiqua!!! EAT MY SH|T AND DIE CREEP! LEAVE ME ALONE! How’s your baby doll doing, TROLLmine? Is it hungry ? WHY would she even accept the offer?! WHY do people in the industry accept roles or opportunities that they KNOW they do not deserve?! Even if it didnt cross her mind, someone on her team KNEW that the public would be outraged! HOW in 2019, are the producers of the Grammy telecast this out of touch with the reality of our day & time? THIS IS A HORRIBLE IDEA! I love jlo, but please drop out of this. I mean apart from JLo being fab but having struggle vocals why they picking only one performer for this tribute? 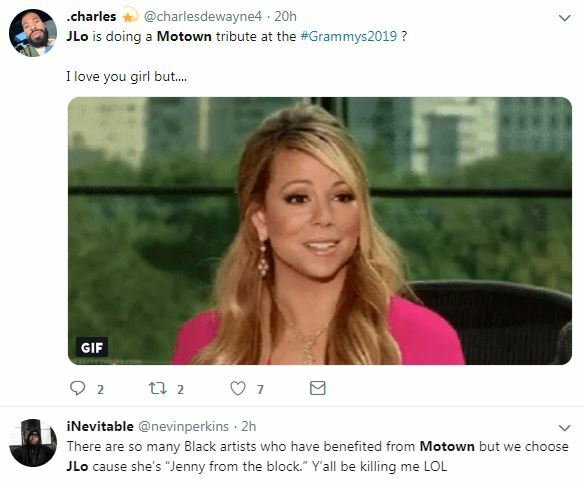 Look… Maybe limit JLo to ONE of her favorite Motown songs, and keep it moving. No medley or her typical Latin Explosion performances under the guise of a “tribute”. Not every single Motown artist has a super soulful voice she just has to pick the right song and she’ll be good. White artists were on Motown too, so color is not a prerequisite to perform a tribute. All the crap singers and rappers you all support and you attack Jennifer?? I think she’s a great entertainer and she will do just fine. Teena Marie was the only white artist I can think of, and she was a major vocalist, and would have been welcomed. Hell even Kelly could have been invited as well, but Motown, a black owned company during black history month, and the first performer they announce is JLO? She can barley sing her own songs, she shouldnt do tributes… She cant even pull off Diana..
Jennifer Lopez is going to do amazing! She is an excellent performer! So excited for this! The issues i have with this is Jennifer should’ve said thank you but no! The grammy’s are well known for their bad choices/decision’s so it leaves it up to the artists to decide what makes sense instead of thinking about securing the bag, she should’ve known their would be backlash from this. If they wanted someone of the paler complexion they could’ve asked JoJo or Jessie J, or if they wanted diversity they could’ve contacted Jessica Sanchez. I think the Grammy’s want to make a fool of Jennifer and she wants to make a fool of her self. Love Jlo but this is not it. She coule have at least backed out with some excuse. But despite her vocal ability, she really wants to sing lol. With the majority of her shows these past several years, she’s cut back on her dancing to showcase her vocals for some reason. Everyone has said it in reviews. We want to see you dance, so just DANCE! But hey, 🤷🏿‍♂️.. this will be interesting to see i guess. Jennifer Lopez is pounding the promotional pavement in support of her many ventures.